Available from Sunday 14 December, 2003 at 10:00 am. Due to its scandalous subject matter, Salome shocked Europe when it was first performed in Dresden, in 1905. The scene of Salome kissing the freshly severed head and extraordinarily tense music were so new and sensuous that the opera was prohibited from being performed in various cities, making the name of Richard Strauss known to the world with a peculiar ring. The one-act opera using a German translation of the play of the same name by Oscar Wilde as a libretto without changing its content is filled with rich and sweet melodies as well as daring discords. The challenging title role of Salome, which requires considerable skill to sing, act and dance the famous Dance of Seven Veils, will be played by Eva Johansson, who created a sensation when she made her debut at the Frankfurt Opera as Salome in 2001. 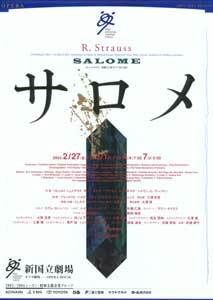 The repeat production of Salome at the New National Theatre, Tokyo is based on the famous version directed by August Everding, a great master in the field of German operatic direction, which has been performed at the Bayerische Staatsoper. The aesthetic stage setting and costumes, as well as impeccable stage direction, will more than do justice to the highly sensuous beauty of the work. The setting is King Herod’s palace in Jerusalem around 30 A.D. Salome, daughter-in-law of Herod, who wins his favor, takes interest in Jochanaan (John the Baptist), who is imprisoned in the cistern in the courtyard, and orders Narraboth, captain of the guard, to bring him out for her to see him. She tries to make advances to him, but he repels them and accuses her mother Herodias for the sins she has committed and is taken back to the cistern. Asked by Herod to dance on condition that he will grant her whatever she desires, Salome puts on seven veils over her naked body and dances a bewitching dance. After her Dance of Seven Veils, she demands the head of Jochanaan.